Kaolin (CI 77004): is a hydrated aluminum silicate, also known as china clay. It's very pure, soft and matte, and is highly prized for its gently absorptive properties and lustrous feel. Approved for use in cosmetics in the U.S., E.U. and Japan. Kaolinite (/ˈkeɪəlɨˌnaɪt/) is a clay mineral, part of the group of industrial minerals, with the chemical composition Al2Si2O5(OH)4. It is a layered silicate mineral, with one tetrahedral sheet linked through oxygen atoms to one octahedral sheet of alumina octahedra. Rocks that are rich in kaolinite are known as kaolin or china clay. The name is derived from Chinese Kao-Ling (高岭/高嶺, pinyin Gāolǐng), a village near Jingdezhen, Jiangxi province, China. The name entered English in 1727 from the French version of the word: kaolin, following Francois Xavier d'Entrecolles's reports from Jingdezhen. 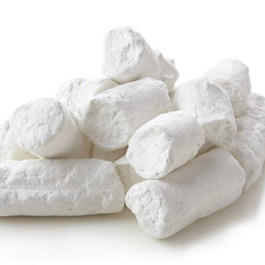 In Africa, kaolin is sometimes known as kalaba (in Gabon and Cameroon), calaba, and calabachop (in Equatorial Guinea). Kaolinite is one of the most common minerals; it is mined, as kaolin, in Pakistan, in Vietnam, Brazil, Bulgaria, France, United Kingdom, Iran, Germany, India, Australia, Korea, the People's Republic of China, the Czech Republic, Spain and the United States.